In September, the San Francisco Online Community Meetup welcomed Cara Jones, founder of Storytellers for Good, and JD Lasica, chief strategist at Socialbrite. Jones and Lasica spoke on the topic of using storytelling for community building. Jones kicked off the event by sharing important storytelling principles that she illustrated with video examples. The principles she shared come from her background as a journalist and current work as a producer. Aim for the heart. Emotion will pull viewers into your story and help them remember your message. Let your audience feel what you or your story subjects are experiencing. Drawing emotion requires you, as the story creator, to truly be present in the moment. During interviews being presents means even allowing silence so your subject can move at a pace that is comfortable for them. Doing this builds the trust required for your subject to open up. Let your characters lead. If you are looking to capture people on camera think "G.O.A.L." Identify people who are genuine, outgoing, articulate, and lively/likeable. Natural energy levels come across lower on camera, which is why it’s important to find lively, outgoing people. Help your subjects be their best natural selves by filming them in their natural environments and treating interviews like conversations. Give structure to your story. Having a clear beginning, middle, and end helps the viewer follow the narrative and message. However, don’t be afraid to start with the end of the story and work your way to the beginning! (Bonus tip) Teach a lesson. Following a story subject as they overcome some obstacle increases the dramatic tension and gives your audience something to cheer for – increasing engagement. Lasica followed Jones by making the case for why stories matter for community. "To tell a story is to be human," Lasica told the audience, using the Lascaux paintings as examples of humanity’s legacy of storytelling. 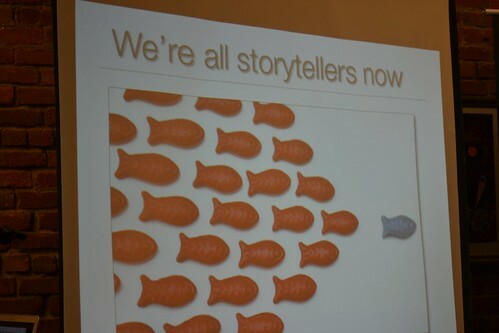 Throughout time storytellers have used the tools available to them to help transmit their stories. Social media and technology are the newest tools available to us for storytelling. The availability of social media and other technological tools make it possible for all of us to be media producers. Lasica advises aspiring storytellers to make use of the tools available to them and get in the habit of telling their story. Would-be storytellers who don’t know where to begin can start by simply telling stories about their organization and its cause. Leverage stories of your organization by involving the very people your organization is trying to reach out to. Tap into a sense of universality to create stories that resonate with your intended audience. A subject that is seemingly big or complicated can be made relatable by being broken down into smaller facets. Keep it simple – a photomontage with several powerful images can make for a great story. And consider details like music, which can heighten and enrich the emotions your story is trying to convey. If you’re inspired by Jones and Lasica’s advice and interested in honing your digital storytelling chops then stay tuned for TechSoup’s upcoming 2013 Digital Storytelling Challenge. Details about the upcoming challenge, plus additional storytelling tips and resources are available via the TechSoup Digital Storytelling Challenge site.